rideTYRANT.com: Riding on the Eastside! 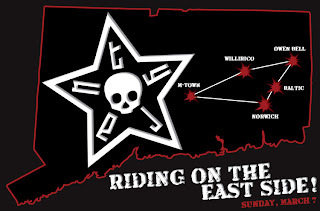 We're planning on hitting up the far eastern portion of the state on Sunday for some sunny, 50 degree weather BMX action. The plan is to leave M-Town at 11am and hit up the Norwich Park, Baltic Park, the Owen Bell Skatepark in Killingly, and on the ride home maybe hit up some street in Willirico. Who is down? Hit me up on the Facebook event page: CLICK HERE.